90 points, Los Angeles Wine & Spirits Competition! Fresh-from-the-field blueberry aromas and flavors. 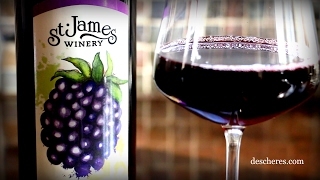 St. James Winery Blueberry Wine is delicious served chilled with your favorite dessert, especially if that dessert is ice cream covered in Blueberry Wine Sauce. For more than 40 years St. James Winery has been producing unique regional wines. They make wines that reflect the natural character of each of their grape varieties and of the special place they are grown: the Ozark Highlands. Hard work in the vineyards and winery has paid off. St. James Winery is consistently one of the top gold medal winning wineries in the country. Our customers’ love of our fruit forward style has made us one of the top selling regional wineries in the United States. Pure, true blueberry flavor here, none of that artificial stuff. Surprisingly clean, balanced and not too sweet! Enjoy with soft cheeses, tarts and desserts and of course, on top of ice cream. Watch our video for a cocktail recipe!